This fish is characterized by its rooster-comb and looks like no other fish. There are two dark blue or black curved bands on the flanks. The dorsal fins are banded with alternate dark and light stripes. Other small fish and crustaceans. Found along the western coast of the US down to Mexico. Inhabits shallow inshore areas along sandy beaches. 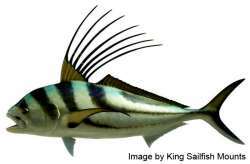 Roosterfish can get up to 4 feet long and 100 pounds.